for a continuing faculty position at the Assistant Teaching Professor level, with an expected starting date of July 1, 2019. Agreement between the University of Victoria and the University of Victoria Faculty Association. with other instructors; they will also be expected to participate actively in departmental activities. assessment is desirable; the ability to teach courses in Japanese culture would also be an asset. The deadline for applications is January 11, 2019. Humanities. It has particular strengths in Chinese and Japanese Studies, and a growing program in Southeast Asian Studies. initiatives, such as the Centre for Asia Pacific Initiatives. are represented by the University of Victoria Faculty Association (http://www.uvicfa.ca). frconsultant@uvic.ca. Any personal information provided will be maintained in confidence. institutions and/or international equivalents at the time of a site interview. immigration requirements, Canadians citizens and permanent residents will be given priority. candidate has specialized in the teaching of a foreign or second language. • A minimum of two-year experience teaching Japanese at the college or university level. oral communication skills from beginners to advanced levels. mobile devices, online media, etc. • Knowledge about class management such as BrightSpace. or provide proof of Work Visa/Permit prior to offer of employment. appointment but may lead to additional work in the department. Start Date: December 1, 2018, teaching begins January 2, 2019. We are conducting a survey to learn about Japanese language educators’ perspectives on the issue of diversity, inclusion, and professionalism as it pertains to their professional field. We will summarize the information collected from this survey and use it in a panel discussion we are organizing at AAS (Association for Asian Studies) next March. We hope that this panel session will serve as a valuable forum where many Japanese language professionals come together and share their perspectives and experiences on this issue. We also plan to write a report based on the panel discussion and disseminate it in a publicly available format. We would be grateful if you could take a few minutes to answer this online questionnaire. Please be assured that your responses are anonymous and only the project team will have access to your individual responses. We will tally the collected information as numerical data or narratives without any personal information to ensure that no individuals will be identifiable upon presentation. We truly appreciate your forthright responses as well as your time and support for this project. Access the survey HERE. Please complete by November 30, 2018. Established in 1863, Huron University College is the founding college of Western University and offers liberal arts and theological programs. Huron is distinguished by its small classes and teaching excellence in a personal, supportive community. Huron is committed to providing its students with an engaging and inspiring educational experience that gives them a distinct advantage throughout their entire lives, and challenges them to be leaders with heart. Interested candidates should forward (by email) a letter of application, curriculum vitae, summary of research and specific teaching interests, pedagogical dossier (including statement of teaching philosophy, evidence of successful teaching, and sample course syllabi); as well as three confidential letters of recommendation. Completed applications will be reviewed commencing December 31, 2018 and will continue until the position is filled. lecturer in Japanese-Language who will teach one class per week (Thursday evenings from 6:30 pm – 9:00 pm). Express yourself and your passion for Japan in a short video! This is the 2nd contest for students in Canada who are learning Japanese language and culture. Express yourself and your passion for Japan in a short movie of 100 sec.! The Japan Foundation is an organization promoting cultural exchange between Japan and other countries in order to advance international mutual understanding. The Japan Foundation, Toronto is one of 25 overseas offices, offering programs grouped under three main areas: Japanese-Language Education, Japanese Studies and Intellectual Exchange, and Arts and Cultural Exchange. This job posting is for a full-time Education Consultant (Japanese Language Education) position for a period of one (1) year, renewable up to four (4) years. Please visit the below page for full details. 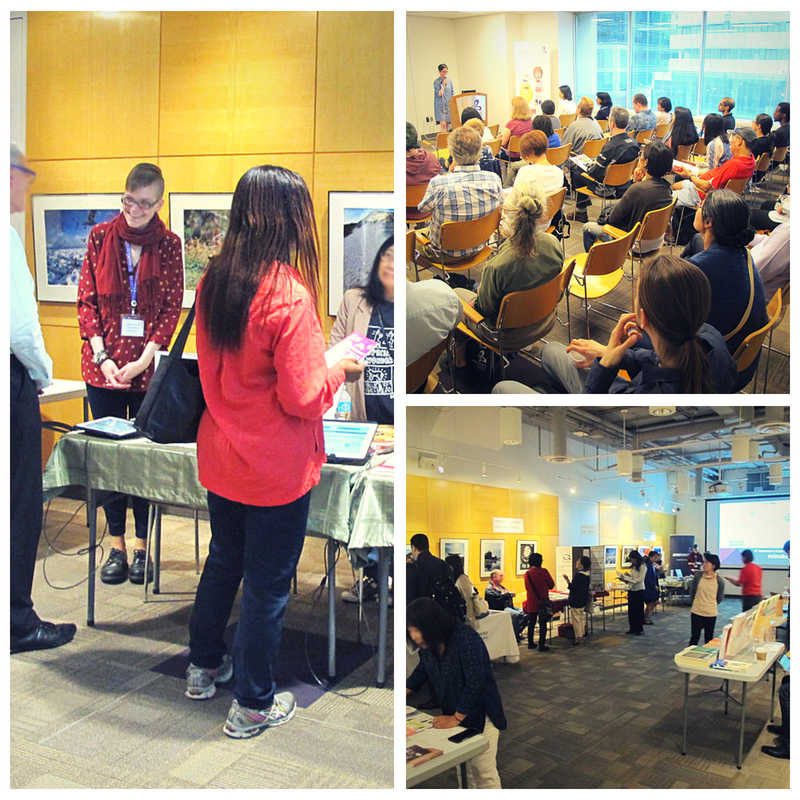 Japanese Study Fair at the Japan Foundation, Toronto! Are you interested in studying Japanese but don’t know where to begin? Do you understand some Japanese but are looking to put your skills to the test? Friday, August 17th for our Japanese Study Fair! share information about their programs, including booths and presentations. Free resources and door prizes available! We ask that those who participate both in person and online please register at the website listed below. During the workshop, online participants can ask the presenter questions using the chat box. However, the lecturer may not be able to answer all online questions depending on the situation. This information exchange meeting will not be recorded. We appreciate your understanding that there will be no opportunity to watch the event online after the fact. The link or “Meeting ID” will be sent to those who register in the workshop. The program is downloaded automatically and you can connect the site automatically. It may take more than 5 minutes especially for the first time, please open the link more than 5 minutes ago for those who use the system first time. For those who will use smart phones and tablets, please download the application called “ZOOM Cloud Meeting” before the event. After opening the application, input the “Meeting ID”. 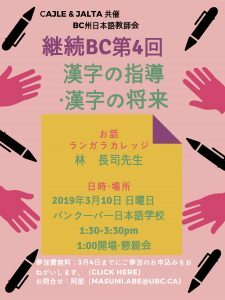 Details：This is a four-day workshop designed for non-native Japanese language teachers, including a one-day workshop open to other teachers on the first day. Applications should be submitted via e-mail to Ms. Noriko Saito (nsaito@jftor.org) at the Japan Foundation, Toronto no later than May 22, 2018. The Department of Modern Languages at Douglas College is inviting applications for a Probationary Regular Full-time Position in Modern Languages (Japanese), commencing at the end of August 2018 and finishing in August 2019.